Arsenal has today revealed the latest team news ahead of their match against Cardiff City on Tuesday. Arsenal has this season been heavily affected by injuries and this has been one of the reasons why their unbeaten run ended, got knocked out of the Carabao Cup and their recent FA Cup game against Manchester United saw them lose two more defenders to injuries. Arsenal has however released an injury update on its official website. Arsenal defender Sokratis Papastathopoulos did not finish the Manchester United game on Friday and the club has today confirmed that he will be out until the end of February because of an ankle injury. This is devastating news to the gunners because he has been their best defender this season. 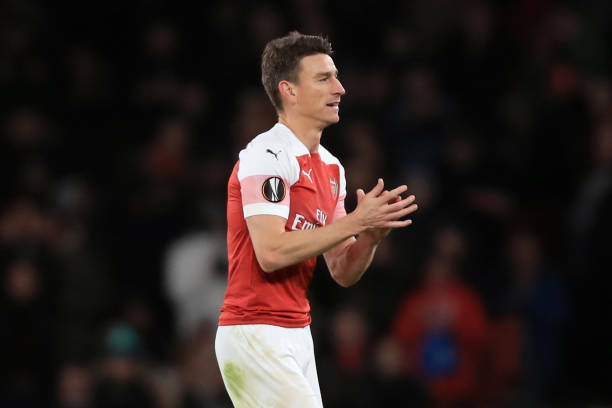 Laurent Koscielny also got injured on the same day as he received a kick on the face from Romelu Lukaku and was also substituted. The club has said that he has bruising and soft tissue swelling on his face and jaw and that he is getting assessed every day but a return date was however not revealed. The gooners will be hoping that he is available for the match against Cardiff City and Manchester City. Rob Holding has been on the sidelines for months now and the club has confirmed that the Englishman is still recovering from the surgery. Holding has been greatly missed because he was working well in a back three. Bellerin is still being assessed ahead of the surgery while Danny Welbeck is still recovering from his surgery.